Excavation was conducted at the site of Azoria Kavousi in eastern Crete for a period of six weeks, from May 31 until July 13, followed by 3.5 weeks (July 14-August 8) of study, cataloguing, and processing of finds at the Institute for Aegean Prehistory Study Center for East Crete (INSTAP-SCEC) in Pacheia Ammos. The primary target areas of excavation were the west and southern slopes of the South Acropolis (Areas A, B, and D). The purpose of fieldwork was to finish excavating the rooms of the andreion complex on the upper West Slope in order to elucidate the plan and function of the building and its associated structures; to continue exploring the Southwestern terraces where two buildings had come to light in 2003, where there were indications of preserved Final Neolithic and Early Iron Age remains, and where excavation had revealed details of the 7th c. B.C. renovation and transformation of the EIA landscape; and finally to begin exploring the wide flat terrace immediately south of the South Houses which had seemed to be the likely location of the settlement’s agora. 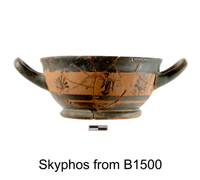 The University of North Carolina at Chapel Hill and the American School of Classical Studies at Athens completed its third season of excavations at the site of Azoria (Azorias) in the region of Kavousi in northeastern Crete, from May until August 2004. The project is conducted by permission of the Greek Ministry of Culture, under the auspices of the Archaeological Service of Eastern Crete. Excavation was conducted for six weeks, from May 31 until July 13, followed by 3.5 weeks (July 14-August 8) of study, cataloguing, and processing of finds at the Institute for Aegean Prehistory Study Center for East Crete (INSTAP-SCEC) in Pacheia Ammos. The primary target areas of excavation were the western and southern slopes of the South Acropolis (Areas A, B, and D on the plan). The 2004 staff consisted of 74 people: the Project Director (Donald Haggis); Field Director (Margaret Mook); Zooarchaeologist (Lynn Snyder); Palaeoethnobotanist (Margaret Scarry); Physical Anthropologist (Maria Liston); Architect (Rodney Fitzsimons); Topographer/surveyor (Georgos Damaskinakis); Excavation Foreman (Manolis Kassotakis); Conservators (M. Tzari and L. Usman); Chief Conservator and Architectural Conservator (Stephania Chlouveraki); Artist (Roxana Docsan); Pottery and Finds Registrar (Yuki Furuya); Lithics specialist (Tristan Carter); pottery-shed managers and field registrars (Jennifer De Ville and Marie Archambeault). Supervision and primary documentation of the daily excavation were conducted by seven trench supervisors (M. Alonge; E. Anderson; M. Eaby; R. Cuthrell; P. Lesperance; D. Mellican; S. Pak). They were assisted by sixteen workmen (A. Dantes; E. Dantes; Y. Grammatikakis; P. Hantzidakis; G. Kanitakis; B. Kareklakis; S. Koutsakis; E. Kophinakis; K. Leonoudakis; E. Maniadakis; Ch. Mazonakis; S. Papadakis; B. Phiorakis; G. Souriadakis; N. Spiliarotis A. Syritoudes) and 33 student volunteers. There were four potwashers (P. Asbesta; E. Kophinaki; K. Mavromichelaki; A. Tzani). Funding for the project was provide by the National Endowment for the Humanities (RZ-20812); the National Geographic Society; the Loeb Classical Library Foundation; the College of Arts and Sciences, the Office of the Vice Chancellor for Research, and the Department of Classics of the University of North Carolina at Chapel Hill; the Institute for Aegean Prehistory; the INSTAP Study Center for East Crete (in kind). 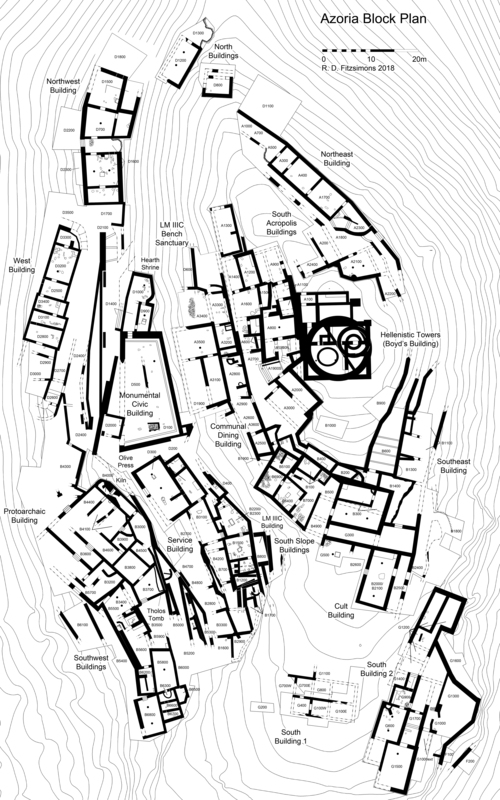 The broad aims of fieldwork are to document parts of a nascent Greek city center (ca. 1200-500 B.C.) that are relevant to reconstructing stages of its development and to examine the evidence for subsistence and surplus production that relate to the restructuring of kinship relationships and the emergence of corporate groups. The plan of this stage of work (2002-2006) has three primary objectives: (1) to understand food provisioning in the civic context; (2) to recover evidence for class differences in terms of differentiation of processing and consumption patterns in various domestic and civic contexts; and (3) to explore stratigraphically earlier EIA levels at the site within both civic and habitation areas with a view to understanding the changes in the formal structure of the site, the economic systems, and social organization of the settlement throughout the Early Iron Age and before the establishment of the city in the seventh century B.C. Another goal of work in 2004 was to continue exploring early occupational levels of the site, exposing more of the Final Neolithic settlement on the southwest terrace (B1200 and B1700). (1) complete the excavation of the andreion complex on the upper West Slope of the South Acropolis (A600; A1600; A1900; A2700 and A2000) in order to recover the plan of the building, the function of its various components, and to understand the relationship between storage (A1200; A1400-1500) and food processing areas (A1600 and A600) on the lower terrace and consumption areas (dining rooms) on the upper terrace (A800, A1900, and A2000). (3) continue exploring the southwest terrace begun in 2003, expanding both south (B1700) and north (B2200-2300; D100-500) of the trenches opened in 2003 in order to determine the nature and extent of the Final Neolithic settlement in this area; the character of the Early Iron Age occupational levels and the transition from EIA to Archaic; and the plans and functions of the Archaic buildings. (5) open an exploratory trench on the terrace below and west of the southwest terrace (B1600). In 2004 excavation was conducted in 22 trenches, 18 of which were new sample units while four continued trenches begun in 2002-2003. Given the unevenness of the terrain and that architecture is exposed across much of the surface of the target area, we defined sample units (excavation squares) by visible architectural spaces (basically rooms and courtyards) rather than a measured grid. This flexible definition of unit size required that benchmarks and survey points be located with GPS as needed during the course of excavation. Visible wall lines, streets, and contours determine the location of initial sampling units. Sampling sub-units (called “loci”) represent stratigraphic components of variable dimensions, within which the excavators measure the volume and dry-screen 100 percent of all visibly anthropogenic matrices using quarter-inch mesh rocker sieves, collecting artifacts, bones, and botanicals. “Intensive sampling loci” were defined as specific deposits requiring sampling for systematic flotation. In 2004, 676 individual stratigraphic/sampling units (pails) were excavated from across the site (Areas A, B, and D). 2646 zembiles (20-liter rubber buckets) (52,920 liters) of matrix was sieved by means of the quarter-inch rocker screen, while 117 standard and 414 intensive soil samples were recovered and sieved by means of floatation (from a total of 243 pails). The carbonized botanical remains from the flotation should be transferred to the Archaeological Research Laboratories of the University of North Carolina at Chapel Hill, pending application and approval by the Greek Ministry of Culture. Excavation along the west slope in the andreion complex permitted us to examine the transitional space (A1900) between A800 (the room with the stands) and the large dining hall in A2000 excavated in 2002 and 2003, while determining the connection between these rooms and the lower terrace with the storerooms and kitchens (A600; A1200; A1400-A1500). Excavation in A1900 continued work begun is 2003, recovering two rooms between A800 and A2000. The northernmost of these rooms, connected to A800 by means of a wide doorway, is preserved to 3.0 m. N-S by about 5.0 m. E-W. The fullest extent of the room –on its eastern and western sides—could not be determined as a scarp was left in place on the east in order to buttress the remains of the collapsed eastern wall; on the west the floor is preserved to the erosion line. The well-preserved central area of the room immediately south of the doorway is paved with limestone and schist pavers. On the east there is a series of three irregular square built platforms (ca. 0.50 x 0.60 m.), separated by paving stones. The southernmost platform is built against the south wall of the room—a spur wall that divides the north and south rooms—while the northernmost platform is constructed against a low bench that abuts the northern wall and continues into the scarp on the east. The platforms are one course high, utilizing limestone cobbles, small boulders, and phyllite clay in their construction. The purpose of these low platforms is not clear and there is little in the way of finds from the rooms to suggest their specific function. They may have been used to support the terracotta stands found in adjacent A800, or wooden fixtures such as chairs or the legs of a bench. A small pithos was recovered inside the doorway on the west side of the room, and an array of cup fragments were found scattered amidst the pavers and wall tumble on the floor. The presence of ceiling clay across the preserved surface of the room suggests that the area was roofed. A bedrock-cut ramp descends from this paved room into a smaller room on the south—a vestibule which is entered from a porch on the west. The east wall of the vestibule retains a deep layer of fill that is visible above and behind the top extant course of the wall on the east. The room’s floor slopes down to a step and clay ramp on the west which forms a porch divided by a pier. A two-course step leads from the porch into the large hall (A2000) on the south. The clay ramp descends sharply on both sides of the pier toward the west where two risers are preserved, running the full width of the porch. A bedrock shelf extends to the west where the bedding for more stairs is preserved in the north and south (in A2700). Two bedrock-cut post holes indicate the location of posts to support an overhanging roof. In the porch there was considerable dining debris—marine shells, animal bones and drinking cup fragments and fragments of two fenestrated stands (A1914.7; A1918.3)—perhaps waste debris swept out the building from the adjacent rooms A2000 and the north room of A1900 (the room with the built platforms). Excavation continued in A1600—a trench opened initially at the end of the season in 2002, but discontinued because the room’s east wall (the west wall of the storeroom in A1500) was discovered to have tilted precariously to the west. Wall consolidation in 2004 permitted the safe excavation of this space, allowing us to establish a transition between the storerooms in A1200, 1400, and 1500 and the kitchen areas to the south in A600. While only the eastern half of the floor is preserved, its finds suggest food preparation. A built bin with a pithos was found to the south of the doorway to A1500, while a smoothed (abraded) round limestone (sideropetra) work platform was found imbedded in the floor just outside the bin near the south wall of the room. Around the work platform were found two medium sized querns and a large handstone and a triton’s trumpet shell. A second triton’s trumpet was found north of the work platform. On the north side of the room were found two large querns and a medium to small size quern; a number of handstones, a lekane or conical bowl with elbow-shaped handles (bar-handled lekane), a lekythos with a satyr and nymph. Other finds from the room include a cylindrical terracotta krater stand, a piece of embossed sheet bronze, a bronze finger ring, an iron door or window ring, a number of spindle whorls and loom weights, an iron blade, and a bronze pin. While the western half of A1600 is not preserved above the level of floor packing, excavation to the south recovered a series of paving stones along the western edge of the north kitchen of A600, suggesting a small exterior courtyard giving access to both north and south kitchens, and perhaps to A1600 as well. It is possible that this paved courtyard opened onto a N-S street or corridor that ran along the west side of the andreion complex –past A1300, A1400, A1600, and then south along the western edge of the kitchens (A600), giving access to the porch in A1900 and a room far to the south in A2000. We have not yet excavated the full extent of this road south of A2700 or along the western contour because of the logistics of dirt removal during excavation. A portion of a single room west of the main dining hall in A2000 and south of the corridor in A2700 was excavated in 2004; neither the west nor the northern limits could be determined. Fragments of two fenestrated stands (A2013.3; A2013.2 and A2013.3) were recovered from the debris above the floor; from their position and the disturbed condition of the west wall of the A2000 hall, it is not clear yet whether these stands belonged in this room or in the main hall above and to the east. Excavation along the West Slope has now established the essential form of the building which we have called the andreion complex: the lower terraces consist of three storage areas, A1200, A1400 and A1500, which are connected directly by doorways to A1600, a food-preparation area as well as a transition to the small kitchens and courtyard in A600. A corridor led south from the kitchens to a wide staircase that led to a porch and vestibule allowing access to two separate areas of the main building: on the south a large dining hall (A2000), and on the north the paved room with built platforms (A1900) and beyond it the room with the terracotta stands (A800). We can distinguish therefore three main components of the building: storage and food processing on the lower level to the west and north, and ceremonial consumption on the upper level to the south. Furthermore, the porch and vestibule appear to separate and differentiate areas of consumption. The large hall in A2000 was accessible directly from the porch and while it had remains of terracotta stands, it is capable of seating a large number of people, and perhaps functioned as a general dining hall serving the routines of the syssitia—accommodating guests and agelai as well as formal members . The rooms to the north on the other hand are accessible only through the vestibule via a narrow bedrock ramp; their special function is perhaps indicated by the pavers and platforms in A1900, and the assemblage of krater stands in A800. The north rooms could therefore have had a more restricted access and specialized function suggesting a segregation of participants in various activities of dining, drinking and libation. The southern terrace: the N-S street and large civic building (B2000-2100; B2400-2500). 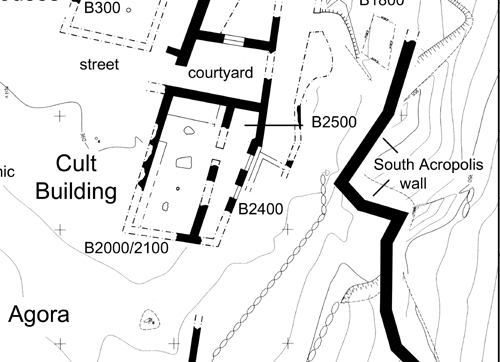 The wide flat area south of the south houses (B100 and B300) was investigated in 2004, recovering a segment of a long street (B2400) that runs south from the building in B1100 and B1300 along the southeastern side of the South Acropolis. This street is evidently the main N-S road on the site linking the wide open southern terrace—which may have been the settlement’s agora—with the eastern artery that climbs north along the contour to the northeast building. A western branch of this road runs south of B1300 along the east side of B300 where a series of steps leads to small rectangular courtyard that opens onto the E-W street running along the southern edge of the South Houses (B100 and B300). The eastern branch of this N-S street was explored in 2004. It seems to have been constructed of hard-packed clay, cobbles, and bedrock, forming rough steps as it descends from north to south. As it runs east of the courtyard (southeast of B300), it is bordered on the west by the foundations of a megalithic wall—and on the east by a narrow balustrade wall. Two well-built steps are preserved in the middle of the road, and on the west, a bench was constructed perpendicular to the steps, up against the megalithic wall. At the southern edge of the bench a clay ramp ascends thorough the wall into a doorway (with a bedrock-cut door pivot on the north side) onto a landing that fronts a monumental building, ca. 12 m. north-south x 5.0 m. east-west internal dimensions. Past the doorway, a passage on the right leads north into a rectangular room whose floor surface and ceiling clay was well preserved on the north side. This room was possibly an anteroom or vestibule ca. 5.0 m. long and 2.0 meters wide which bordered the monumental building on the east and provided its main access from the street. Although a doorway between the anteroom and the main building is not preserved, we reconstruct one in this area. The northern end of the building is best preserved where a double megalithic wall supports the courtyard above and on the north (southeast of B300). 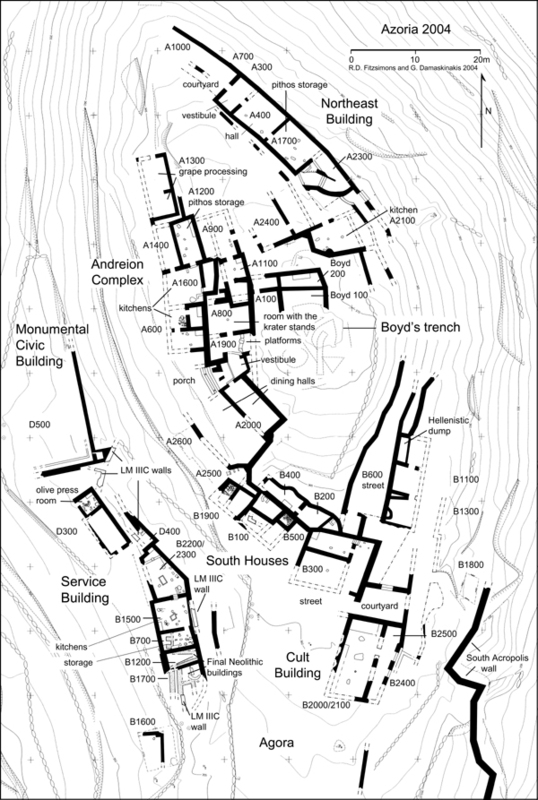 While the building appears to have suffered considerable plough-zone destruction, especially in the southwest corner, where only the bedrock and bedding are extant, it is possible the reconstruct the plan of the structure. It appears to have been a single room with a large rectangular cut-bedrock platform in the center (ca. 1.40 x 1.20) and wide hard-packed phyllite platform bordered by stones (ca. 4.0 m. x 1.50 m.) against the north wall. A small part of a stone built bench is preserved in the northeast corner while indications of another are preserved along the west side of the room. Two bedrock outcrops indicate the locations of post supports, north and south of the central platform. 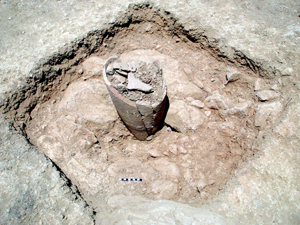 South of the bedrock platform was found small stone-lined pit that supported an upright terracotta amphora. The amphora is a heavy thick-walled vessel—evidently imported, as neither the obsidian-tempered fabric, nor the thick yellow slip are characteristic of contemporary local Archaic pottery from the site. The amphora had been set carefully into the stone-lined pit after its base had been broken off creating an aperture at the bottom, effectively a rhyton-like installation within the center of the room. Yellowish gray phyllite clay was then set around the amphora and over the pit, filling in the southern area of the room to bring up the level of the floor. The amphora, preserved to its shoulder, protruded well above the level of the floor. Goat bones were found in the fill within the vessel—three lower legs and feet and cranial fragments of a butchered animal of prime meat age; while there was no evidence of burning on the bones or in or around the amphora, the animal bone assemblage not inconsistent with remains of sacrifice. Save for this modified amphora, there were few finds that could indicate the function of this single-room building. 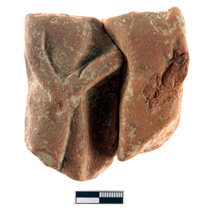 A fragmentary terracotta votive plaque however was recovered in the northwest area of the room. The plaque illustrates a male figure with a club or sword, who faces the arched back of what may be an animal—a lion, deer or perhaps an agrimi standing on its hind legs. Other finds from the room include fragmentary pottery, including drinking wares, and in the wash above the floor, an iron nodule, and a bronze pan formed into a scoop or spoon. On the street outside the room (B2400) were found two silver Argive tetraobels. Excavation at the west end of the South Houses in B1900 allowed us to recover the western extension of the house in B100 (excavated in 2002). Next to the corridor in B100 on the west, a small paved room came to light similar to the storeroom at the east end of B100. A substantial west wall of the room defines the west end of the house, while the east wall is the west wall of the corridor excavated in B100. The room’s south wall is not preserved. This small paved room appears to be a late addition to the building, contemporary with the blocked doorway and screen wall bisecting and shortening the corridor in B100. Both the screen wall in B100 and the north wall of the paved room were constructed up against a deep layer of fill between the walls and the spine wall, effectively reducing the size of the corridor in B100 and taking out of use a triangular-shaped courtyard formed by the spine wall and a bedrock outcrop on the northeast. A bin and a partially preserved stone-lined fireplace were found built against the bedrock wall of the courtyard. The actual shape of this courtyard in its initial phase of use is not certain because of the later additions to the house. But it is likely that in the first phase of the building the access to the B100 was from the northwest from this courtyard through a doorway at the north end of the corridor. In a later phase, perhaps following an earthquake, a large boulder had fallen into the doorway and on top of the north end of the corridor’s western wall. At this stage, the north end of the corridor was abandoned, filled in, and a screen wall blocked the doorway in to the eastern room and reduced the size of the corridor itself. At the same time, the courtyard was abandoned, completely filled in and the small paved room was constructed west of the corridor, perhaps as a vestibule opening out onto the street to the south and containing a doorway and access to the reduced corridor on the east. A single exploratory trench was excavated on the terrace below and southwest of B1200. Part of a single building came to light in this trench—a north-south wall extant to 4.5 m. in length, which forms part of a building extending to the east under a recent terrace wall. A narrow space (ca. 1.0 m.) between this wall and the scarp supporting the terrace wall was excavated down to the level of wall collapse in order to define the interior wall face. It was decided to discontinue excavation in this space pending the removal of the modern terrace planned for 2005. Excavation west of the wall revealed a corner and return wall extending to the west for 3.5 m. A stone built bench was found in this corner and nearby to the southwest a single stone perhaps functioning as a work platform. The poorly consolidated surface could suggest exterior space for this area. The main focus of work in 2004 was on the southwest terrace of area B, expanding the areas explored in 2003—north of B1500 and south of B1200. B1700, immediately south of B1200, contained a complex and well stratified series of occupational levels spanning a number of occupational phases (Final Neolithic, Early Iron Age and Archaic). The area also provided important information about the character of Neolithic settlement and the transformation of the EIA landscape in the Archaic period. Archaic period occupation consists of a series of surfaces forming a mound of debris in the northeast corner of the trench, evidently layered against the south wall of B1200. At some stage in the build up of the mound a single-course semicircular wall was constructed to contain the fill which appears to have been selected pieces of butchering debris, primarily goat mandibles (enough for 17 animals) from prime meat age individuals (18-24 months). The puzzling selection of these pieces suggests not routine butchering but perhaps a symbolic representation or ritual documentation or display of the animals slaughtered or consumed. This Archaic bone dump appears to have been exterior space, occupying but not completely destroying an abandoned room of an Early Iron Age building that once stood on this terrace. LM IIIC-LG surfaces were recovered across the west and southern areas of the trench—the Geometric surface in the southeast had on it tumble evidently fallen from the wall bedding that runs along the southeast edge of the trench, allowing us to reconstruct the edge of the room in the period. A segment of an LM IIIC wall was recovered in the southwest corner of the trench; it appears to have been constructed on top of a FN wall and to continue into the scarp to the south. This wall may define the western limit of the room in the EIA. The LM IIIC surfaces are constructed directly on top of FN remains, in some cases intruding into FN surfaces and architecture. Excavation in B1700 and in a sondage along the west side of the neighboring trench B700 exposed more FN walls suggesting the remains of three separate buildings. The northernmost FN structure (Building 1) consists of the north FN wall in B1200 which runs west into B700 where a short segment of a return (west) wall is preserved. Two dolomite-cobble paved surfaces, forming rectangular (ca. 0.70 x 0.90 m.) platforms, were constructed against the west face of this return wall, perhaps on the exterior of the building. Above these platforms an anthropomorphic bird-headed figurine was recovered. East of the wall—perhaps within interior space—there was a pit containing a fragmentary pot full of pig bones. Neither the bones nor the pot appear to have been burned, but around the vessel was dark ashy soil and carbon, suggesting to the excavator the location of a pit hearth. Among the bones, many of the meaty parts of the animal were present; the form of the articulated units suggests that parts may have been removed after cooking. FN Building 2 is made up of the south wall of B1200 which extends under the south Archaic wall of B1200, where it seems to meet a wide wall that extends roughly N-S across B1700. This wall is the western wall of a building with two small rooms. 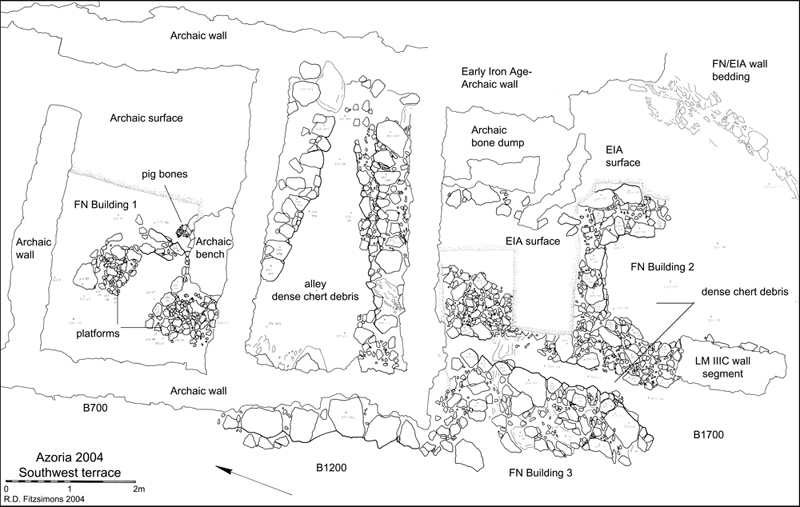 A second wall, the eastern wall of the rooms, is of similar construction and may connect with the E-W wall in B1200, but it is largely obscured by Archaic and Early Iron Age surfaces and installations left in situ during excavation on the east side of B1700. Both walls are wide—ca. 0.70-0.80 m.—and have two well built faces of large dolomite cobbles or small to medium sized boulders with small stones and gravel filling the core created by the two faces. A short, but well-built cross wall runs between these long walls, forming the north wall for a small room which is ca. 1.40 wide and ca. 2.60 long. The northern half of this room had a well-preserved FN surface, while in the southern part, the surface was intact, but covered by LM IIIC floor-packing associated with a rebuilding of the southern extension of the western FN wall. The LM IIIC wall segment is easy to distinguish from its FN predecessors, making use of much larger and more regular gray limestone and dolomite boulders. It is constructed directly on top of the FN wall foundations, conforming to its line. FN Building 3 is indicated by a third N-S wall recovered on the west side of B1700, parallel with the other long walls to the west, and apparently continuing under the southwest corner of B1200. The wall is of the same construction technique as the others but appears to be part of another building or room continuing into the scarp on the west side of the trench. Thus the FN remains in B700, 1200 and 1700 indicate three separate structures: (1) a building on the north with the hearth and exterior paved platforms; (2) a building on the south, separated from the north building by an alley, and containing two small rooms; and (3) a building on the west, represented by a single wall, presumably on the eastern edge of the room. The form of the settlement suggests distinct and separate building units in an open settlement plan; individual buildings separated by alleys and courtyards instead of the agglomerative arrangement typical of Bronze Age spatial organization. The spaces between the buildings have considerable ceramic and chipped stone (chert) debris suggesting discarded material. The cobble-paved platforms in B700 remain a mystery although it is likely that they occupied exterior, perhaps courtyard, space that was used as a general work area. 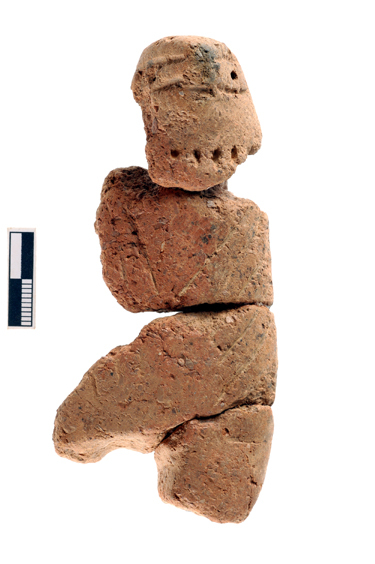 The presence of the anthropomorphized bird-headed figurine is of some importance as such figurines have been found in other Neolithic contexts in exterior (as well as interior) spaces associated with food storage and processing. The function of the room to the east of the platforms is indicated by the pit with the pig bones—possibly a kitchen area. The chert is mostly a poor quality veined dark gray to black chert, used as blades and scrapers. A red chert blade and transverse arrow head were also recovered in 2004. The small size of the rooms in the south building suggests storage facilities, although tools and production material was found above and upon the floor surface of the southern room. A concentration of chert tools and production materials was recovered from the narrow alley between buildings 2 and 3. Another interesting find is a rectangular schist slab with a worked (abraded) depression in the center, and at one end, a series of 11 pecked depressions about 0.5-1.0 cm diameter, forming a rough circle about 7-8 cm in diameter. The tool may have been a work table or platform for a drilling or knapping. 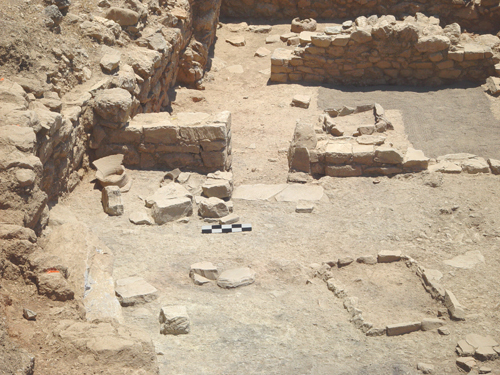 Excavation was conducted north of B1500, following a doorway and steps that were found to lead north into a large room (B2200-2300), about 7.30 meters long. The room’s east wall curves northwest evidently with the natural contours of the hill, creating an oddly shaped curved and narrowed north end. The room is about 5.0 m. wide on the south, narrowing to 2.5 m. on the north. The west wall of the room extends in a straight line north from the west end of the north wall of B1500. Like its neighboring room to the south (B1500, excavated in 2003), B2200 appears to be a large food processing area—a kitchen with a large rectangular stone lined hearth in the center (1.20 x 0.70 internal dimensions); a stone built bin in the southeast corner; just to the right of the doorway; a series of pithos stands and clay/stone bench (ca. 1.00 x 0.50 ) along the east wall; and a small bedrock cut work platform or table on the northeast side of the room. Along the north side of the room, where the space narrows with the curved wall, there is a line of bedrock forming a step and retaining the floor packing and clay surface of a raised floor surface, about 1.30 wide on the east and 0.70 m. on the west. In the center of the line of bedrock forming the riser to the elevated floor, there is a nicely worked round pillar support that divides the step. The north wall of the room is unevenly preserved and seems to conform to and incorporate the worked bedrock. A stone bench in the northeast corner of the room is built up against a large boulder that forms the east side of the north wall and may have been a high threshold for a door allowing access to a small room, D400, above B2300 on the north. A cut-bedrock wall bedding in the northwest corner of the room indicaates foundations of the north wall at the west side, running at the same angle as the eastern part, but set slightly to the south of the line. A pithos and part of transport amphora were recovered from the bin in the southeast corner of the room east of this doorway; another pithos base was found on a stand near the east wall. The amphora fragments consist of the neck, handles and shoulder—the lower body and base were recovered in the adjoining room B1500 to the south. Among the other finds there was an iron ring—possibly a door or window ring—an iron spit socket, a quern, two whetstones, two schist pot lids, a lekane, a bar-handled lekane, a number of pecked and abraded pebbles and pieces of pumice, three spindle whorls, and some 16 pierced metacarpals and metatarsals (modified bone of sheep or goat; and one cow) which may have functioned as loomweights or “gaitania,” (bobbins) implements used in braiding designs on textiles. The loom weights, whorls, and bobbins were found clustered along the south side of the room, several very near the south wall both east and west of the doorway into B1500. This concentration of weaving implements suggests the presence of a loom (either stored or used), south of the doorway where fragments of burned wood were found as well. 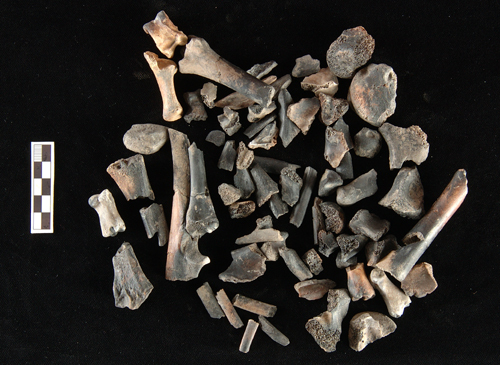 Other modified bone included a goat horn core abraded or intentionally beveled at the end; a metatarsal with a vertical hole drilled though the entire center of the bone, a socket at the proximal, and a hollow at the distal end. Lying above the central hearth were fragments of an iron strainer and a bronze nail. Next to the cut-bedrock table on the north side of the room were several joining fragments of a large fenestrated terracotta krater stand—piece of which were also found in the southwest corner of the trench, slipped out over the southern end of the west wall. On the west side of the room part of a bronze tripod stand was recovered. The piece has one leg preserved—a lions paw—and the rim a row of incised pendent arcaded tongues below a band of convex elements (half barrels); above the leg there is a transitional element, a register with a row of incised chevrons between two circle bands above a series of four arcaded tongues. The leg is hollow and an aperture in the base above the leg may have been a fitting or socket for an attachment of some kind. 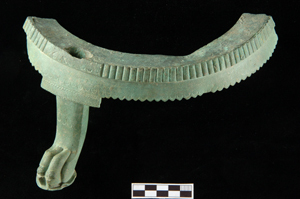 The presence of the fenestrated stand and the bronze tripod stands—elite drinking equipment—suggest a link to the andreion, where a concentration of such stands was found in A800 and fragments throughout the complex. A cylindrical stand was also found in B1500 to the south. 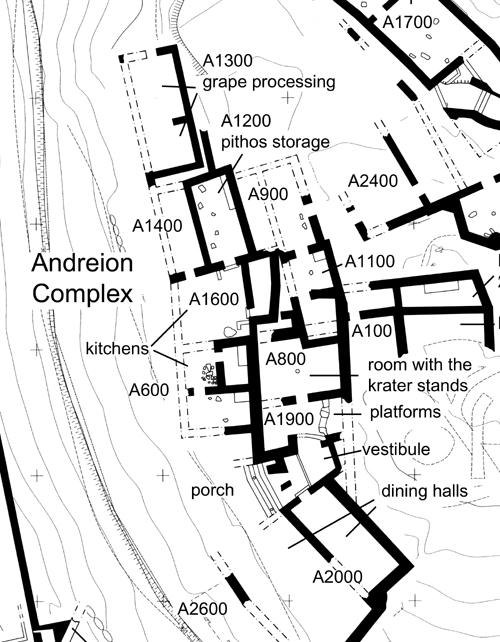 The presence of these two adjacent and connected kitchens of considerable size (B1500 and B2200), each with a large central rectilinear hearth, might indicate centralized and large-scale food processing and meal preparation associate with the andreion on the terrace above and the other civic installations to the north. Immediately north of the kitchen in B2200-2300 is a small narrow room, D400, possibly accessible from a stair in the northeast wall of B2300. The room’s northern and western limits have not been determined. The clay floor surface is preserved across an area of about 2.5 m. N-S by 2.0 m. E-W. The surface is intact along the east wall for a distance of 2.5 m. until a parallel wall intrudes into the room on the northeast, forming the north edge of a stone-built bin. The western and northern edges of the floor are eroded exposing the floor packing underneath, the cobble and gravel fill that makes up the terrace behind the buildings in D300 and D500. This small room contained a number of interesting finds including two querns and other groundstone tools, a large coarse basin or mortar with a conical base or pivot, a fine skyphos, and a large Geometric krater. The space appears to be a storeroom related to the food processing areas to the south in B2200 and B1500. At the western edge of the room, excavation revealed the top of a series of dolomite boulders, an earlier phase wall segment that had been obscured by the deep fill along the terrace. While excavation into the fill southwest of the wall (along the north side of B2300) recovered Archaic pottery—dating the ambitious terracing operation on the west slope—the presence of a large number of LM IIIC sherds in the fill is an indication of the EIA us of the terrace and a possible date of this earlier construction. 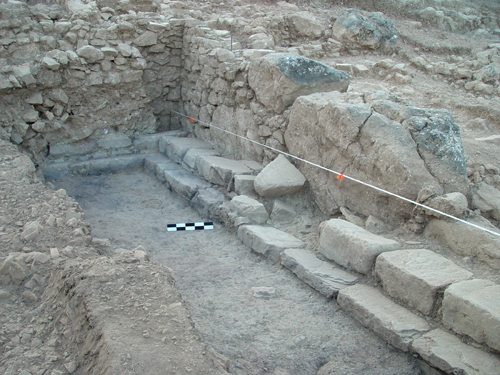 The buildings recovered along the west slope north of B2300-2200 provide evidence of the ambitious Archaic remodeling that transformed the EIA topography of the South Acropolis. The area was occupied by a number of civic buildings connected to the kitchens and storerooms of the southwest terrace. More evidence for food storage and processing came to light (D300), along with a monumental building (D500) which may have been the city’s prytaneion. Two rooms were recovered in D300. While these are clearly related to the kitchens and storerooms to the south (in B700, B1500, B2200-2300, and D400), we have not yet established a physical architectural transition between D400, D300, and B2300. One room is a small square paved area (ca. 2.50 m. square) with a bench in the northeast corner and a small stone press bed, built into the southeast corner of the room on a small bench about 0.50 m. above the floor. The press bed is a pinkish porous limestone square (0.34 m. square) with a worked square rim, and a pecked and smoothed interior bottom surface, 2-3 cm deep; there is a 1.0 cm wide groove cut as a spout in its northwest corner. On the floor below the spout is the base of a small terracotta vessel with a hole in the wall above the base—perhaps the remains of a pot used as an oil separation tank. Although it is small in size, the press bed was likely used for olive processing (mash pressing). A small doorway (ca. 0.80 wide) with a door pivot was exposed the north end of the west wall where presumably the room was entered from a street that ran along the west. Sharing a party wall to the south is another room—a large regular rectangular room, ca. 6.20 m. long (N-S) and 3.20 wide with a well-built doorway, one meter wide, set precisely in the center of the south wall. The jambs are exactly 1.10 m. from each corner. The room was only partially excavated in 2004, removing wall tumble and exposing an uneven layer of ceiling debris and wall collapse. Large pithos fragments recovered in the north end of the room indicate the function of the space as a storage area. In 2005 we will continue excavating the storeroom with the aim of recovering the floor deposit within the room and the transition to B2300 beyond it to the south. These two rooms—an olive press and storeroom—taken along with the kitchens, storerooms, and butchering area to the south, establish this part of the site as an industrial and centralized food processing area—a series of buildings used for various stages of preparation and storage of food. The presence of serving vessels in B2200 and B1500—such as table amphorae, krater stands, and lekanae—suggest the final stages of meal preparation. The two rooms in D300 were built into the hill slope, evidently modifying the EIA slope and transforming the plan of the settlement. Behind the east wall of these rooms, and in the areas to the north and south, a deep layer of fill was exposed. This material consisting of cobbles and angular pebbles in a loose sandy and gravelly matrix evidently forms a deep layer of packing behind the building on the east, filling in the space between the building’s east wall and the upper eastern wall that extends north from D400 a5nd B2300. This fill layer, clearly part of the Archaic rebuilding and landscape modification may have supported a ramp or steps on the north side of the press room; it surely functioned as the foundation and leveling fill for the room in D400. Excavation into the fill in the north area of D300 recovered the corner of a room of a LM IIIC building. Its east and south walls—constructed of dolomite boulders on the south and cobbles and boulders on the north—retain a patch of clay floor on which was a small quern. The room’s orientation is noticeably different from the surrounding Archaic structures—the walls run obliquely NE-SW and SE-NW. The building’s south wall was evidently truncated and destroyed by the construction of the Archaic press room, while the east wall seems to have been cut off by the construction of the monumental building in D500 and the deep filling operation that extended between the south wall of D500 and the north wall of the press room. Excavation north of the food storage and processing areas in D300-400 and B2200-2300 revealed the foundations of a monumental building. The building’s south wall, which is built against the deep fill layer of D300, extends a distance of some 8.0 m. from west to east where it forms a corner, turning north for 20 m. The northern and western limits of the building have not been determined. We estimate an east-west extent of 9-10 m. and somewhat over 20 m. for the north-south length. A trench ca. 8.0 x. 2.0 m. was excavated at the southern end of the building, exposing a section of the building’s clay floor, the south wall, a section of the east wall, and a series of steps lining the interior wall faces. The south wall of the building is made up of four large dolomite boulders, the largest of which is 1.30 high and 2.20 long—the smallest 0.60 x 1.30 m.—between which are sections and courses of smaller dolomite boulders below fairly regular courses of sideropetra limestone boulders and cobbles. Only about one meter of the full face of the east wall was exposed in 2004. It uses dolomite boulders for the lower courses and smaller sideropetra blocks for the upper extant sections. The walls are best preserved in the southeast corner where over 12 course are extant for about 2.0 meters above the level of the building’s interior steps—about 2.50-2.60 m. above the building’s floor level. The building’s interior has an even and hard-packed clay floor and a double row of dressed gray limestone steps runs along the base of both south and east walls. The upper step is 0.62 m. deep, while the lower step is 0.30 m. deep along the south. Along the east wall the top step is 0.62, but the lower step is about 0.21 deep. Each step is about 0.28 m. high, with negligible variation. Along the base of the upper step on the east side, a leveling course is visible—usually schist slabs are used. For the steps, large schist blocks are sometimes used instead of limestone, but the effect of uniformity is maintained throughout. Individual step blocks measure between 0.60 to 1.0 m. in length and between 0.40 and 0.60 deep. The excavated floor area revealed a very uniform hard-packed clay surface under a deep layer of burned ceiling debris which had, especially in the eastern half, considerable amounts of ash and carbon, evidently fallen roof beams and other elements of the building’s flat-roof superstructure. On the floor itself were found a deep plain coarse bucket (situla), a fine painted lekane, and a large number of burnt animal bones, including meat bones of pigs, rabbit, sheep and goat, cow; some burned top shells. Access to the roof and a small square room above and behind the southeast corner of the building would have been feasible from a sloping street, ramp or stair along the south side of the building constructed on top of the deep fill layer that slopes from east to west. The extreme erosion of the surface of the fill layer precludes certain reconstruction of the access path. At the top of the sloping fill layer, at the juncture of the E-W and N-S walls above the southeast corner of the building is a small room (1.19 x 1.03 internal dimensions) that was constructed above and behind the building’s main room, sitting directly on the deep terrace fill that characterizes the Archaic modifications of the slope. The function of this small square room is not yet understood. It had a clay floor set directly on the rubble packing/fill and bedrock, and its northwest corner seems to have been fashioned roughly into an opening or drain. The back of the small room was built up against an earlier wall, which runs at an angle oblique to the building northeast-southwest. The orientation of this earlier wall, on line with the south wall of the LM IIIC building in D300 and its dolomite boulder construction suggest an EIA date, a chronology reflected in the LM IIIC and EIA pottery recovered from the tumble and slope wash debris down-slope of the building. The function of the building in D500 remains uncertain. However, the size and scale of the structure (some 180 meters square); refinements such as the interior rows of dressed blocks forming stepped seats; the use of megalithic construction (large boulders) in the south wall; and the building’s proximity to the centralized food storage and processing areas of the southeast terrace all point to a formal civic function associated with public dining. On analogy with the prytaneion at Lato—the best preserved and attested building of classical date (4th-3rd c. B.C.) on the island—the size, features, and finds of the Azoria building suggest a prytaneion function. The size of the building is nearly identical to that at Lato, and the double row of limestone risers forming the seats is similar to those in the east room at Lato (room 36) in which the steps surrounded a large stone-built central hearth or altar. While Miller (1978, p. 82) has suggested that the risers were used for standing (observing formal sacrifices), rather than sitting, the individual steps at Azoria are sufficiently high to have easily accommodated either function. The risers in the Azoria building approximate the tread width and height of the steps in the neighboring room 37 at Lato, although the depth of the top step (0.62) at Azoria is about half that of the wide platform in room 37. While the situla and lekane are hardly certain evidence of the room’s function, the considerable volume of burnt bone material in the small excavated area of the Azoria building suggests in situ dining debris, unequivocal evidence of feasting, perhaps the remains of the hearth or altar that might yet be found to occupy the center of the structure. Given the length of the Azoria building (ca. 20 m.) it is likely to have room subdivisions, perhaps like at Lato, two main halls and subsidiary rooms for storage. 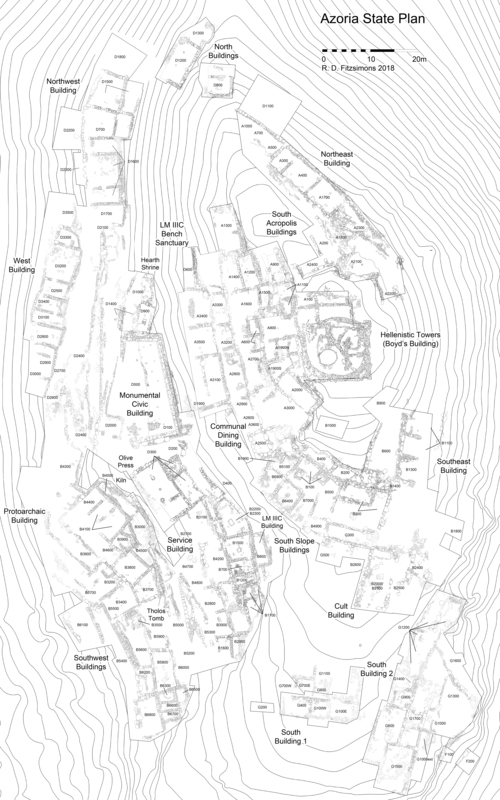 Work at Azoria in 2004 has begun to elucidate the topography of the Archaic urban center, exposing a number of civic buildings and their associated structures, allowing us to begin visualizing the social and political institutions that made up the early Cretan city. The completion of the andreion complex—an attribution not entirely certain in lieu of epigraphical evidence—provides a unique view on the function of this central civic building. 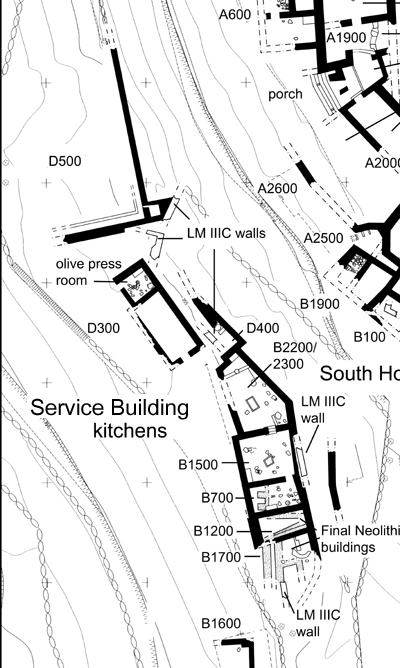 The evidence derived from work in 2004 shows that the complex was separated into two distinct areas buildings on two separate terraces suggesting both formal and functional distinctions: a service suite consisting of food storage and processing was located on a lower terrace in the northern and westerns areas, while the formal consumption areas (comprising the main building) are situate on an upper level south of but contiguous to the service suite. The food storage and preparation area consists of a distinct cluster of buildings, reduplicated storage (A1200; A1400-A1500) and processing (A1600 and A600). The dining/ceremonial halls (A800; A1900-2000) of the complex are contiguous, but distinctly and formally separate—the only access to them is through a stairway and porch, located immediately south of the kitchens, and therefore easily accessible but physically separate from them. The porch and vestibule (A1900) serve to channel traffic and organize communication, controlling interaction between different areas of the main building. Through a doorway in the south wall of the porch is the main hall, A2000. Given its size and accessibility directly from the porch, the room probably allowed more general access, accommodating a large number of people and various drinking and dining activities. The two rooms on the north (A800 and A1900) are accessible only through the vestibule and ramp; they are therefore less accessible than A2000 and their finds and features suggest special functions. The room with the stands (A800) and its adjoining paved room with the stone platforms (A1900 north room) may have served special or more exclusive sympotic or ritual activities involving small groups of the hetereiai participating in the syssitia. This north-south division of areas and the mediating units of porch and vestibule provide insights into the complexity or perhaps hierarchy of the activities conducted in the andreion. Work in the putative agora has clarified the pattern of communication routes and roads along the south and east side of the South Acropolis, while producing yet another civic building—a possible temple. Even though the attribution of the large building in B2000 is not certain, the location of the building at the juncture of two important roads in the city and the architectural features of the building itself—the interior and exterior benches, vestibule, stone-line pit, and clay platform—are suggestive of public ritual functions. The finds within the building are few—the amphora/rhyton and the votive plaque—but nevertheless help to support the attribution of ritual space. Excavation on the southwest terraces has improved our understanding of the Archaic rebuilding of the site at the end of the 7th century. While we had recovered traces of LM IIIC and EIA occupation from across the site in 2002 and 2003, in 2004 a very clear pattern renovation is now apparent. The Archaic structures were built directly into the west slope, a process that evidently involved excavating through and in most cases destroying EIA levels in order to establish new foundations. Pottery from these earlier levels is found throughout the floor packing and leveling fill under and around the Archaic buildings. In many cases the Archaic walls and surfaces were built directly on top of LM IIIC or Final Neolithic levels. In D300 and D500 fragments of LM IIIC buildings are visible, usually in the slope behind or under the Archaic buildings where they were preserved by the ambitious artificial terracing operation conducted with the rebuilding of the site at the end of the 7th c. Given the public character and civic functions of the buildings so far excavated on the hill top and upper terraces, it remains to be seen whether or not regular occupational areas of the site (domestic areas and houses) underwent a similar transformation and rebuilding in Archaic, or whether there is greater adherence to the orientation and organization of the EIA settlement plan and continuity in the use of architecture and domestic space. One wonders if the systematic and radical renewal is part of the design of the civic complex only, or if this major reorganization of the site is applicable to habitation areas as well. Finally we have been able to establish the civic character of the buildings on the southwest slope. The picture we have of this area is one of a series of connected storage and cooking areas, a concentration of food storage and processing probably connected to the prytaneion on the north (less likely to the large building in the agora, or to the andreion on the upper west slope which has its own service areas). From south to north the spaces indicate butchering (B1700), storage (B1200 and B700), food processing (B1500 and B2200), storage (D400 and the south room of D300), possible olive oil production (D300 north room). A similar reduplication of storage and processing space is found north of the andreion on the upper west slope. The evidence of separate and centralized storage and food preparation around the prytaneion and andreion—especially derived from the botanical and zooarchaeological data— should be able to give us a view into the political economy of the early Cretan city. We can begin to explore how these different components of the urban center—andreion, Monumental Civic Building, and temple—functioned, their sociopolitical and economic roles. It remains however to excavate the rest of the Monumental Civic Building in D500, establishing the plan of the building and its archaeological context. The area of the agora needs further work as well in order to establish the use of this space and perhaps the function of the large cult building on the northeast side. Finally our plan of work includes excavation outside and down slope of the civic center with the aim of recovering a sample of houses—domestic habitation and industrial space—which we can compare with the civic sectors.